Raaga.com: DANCE LIKE NO ONE SEES! Madhuri, the ever gorgeous one ofcourse needs no introduction. All of us have come across all her songs in one way or the other. Even with her two children, she has successfully maintained shape and looks gorgeous as ever. Her recent movie ‘Gulaab Gang’ alongside Juhi Chawla was definitely well appreciated for the wonderful acting ofcourse the strong story line that commanded a lot of interest. This infact can be considered her second return after her initial comeback with ‘Aaja Nachle’ which yet again was a hit, thanks to her graceful dancing at every possible sequence. Moreover, the second comeback has done her good as she even bagged a role with Dedh Ishqiya. Her charm ofcourse was loved by many who watched the movie but still the movie did not really become a hit. A dancer par excellence as everyone knows, she is one of the most versatile dancer that any one has ever come across. Infact many of the young girls today ape to be a “madhuri’. Infact there was even a movie that was released titled ‘Mein Madhuri Dixit bana chahathi hoon’. Such is the craze – for her mature acting, her moves, her smile. 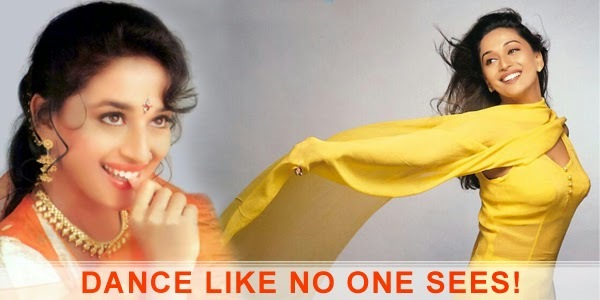 Madhuri was also seen as a judge for one of the popular dance shows in one of the Hindi channels, where she gave them a lot of valuable tips for their improvement. Not many are aware that her fan following also comprises of ace artist M.F.Hussian who has made a lot of paintings on her. Infact he made a film as a tribute for her , comprising of all the painting he drew! Now isn’t that an amazing star power? She has definitely walked her way up through it, in her initial days even working up to late three shifts and has definitely proved herself. We wish this wonderful lady a very happy birthday.